This entry (and most that proceeded and will follow) is a result of a summer-long Noel Mazzone discussion between hemlock and I. Mazzone represents the offensive innovation of the 90s maturing and adapting to the constantly changing world of football. If you’re over 30, you may be able to appreciate how an imaginative spark can ripple into a wave of change as time passes, sometimes taking decades to blossom. Specifically, how the things done in the late 80’s ended up shaping the zeitgeist of football we know today. The previous posts featuring the Alex Gibbs staff clinic was simply a prelude to the larger focus here. The stretch clinic illustrated the brainstorming involved as offenses adapt to living in the gun full-time (“we’re not in Kansas anymore”). As those videos documented, there came a time when Gibbs just threw out tight zone because it wasn't worth investing in as he was getting a favorable return with stretch. While zone and stretch share similarities, many offenses are finding it is easier to just drop one or the other because they just don't have enough time to become proficient in the necessary skills to run them both. While I believe there are some distinct “families” emerging here, I don’t truly believe there is a right or wrong path (both have considerable merit). With that, I will preface this with the disclaimer that most run attacks aren’t as codified as they will be depicted here. In this post, I’ll attempt to illustrate what issues offenses face by choosing a particular path. This post won’t offer any absolutes or hidden truths, its just an editorial on where many offenses are headed. Nearly two decades since Dennis Erickson made the above comments regarding his philosophy, that same tenet holds true for Mazzone. You spread the formation (horizontally) to run the ball. You aren’t running the ball to areas of the field where you are drawing defenders to (outside). With one-back, you empty the box to make running inside easier (by eliminating defenders by alignment) with the added dimension of utilizing outside receivers. I believe the most interesting thing we can witness from the Arizona State Offense is how truly simple it is (we’ll get into greater detail later, but much can be seen by examining their protection). 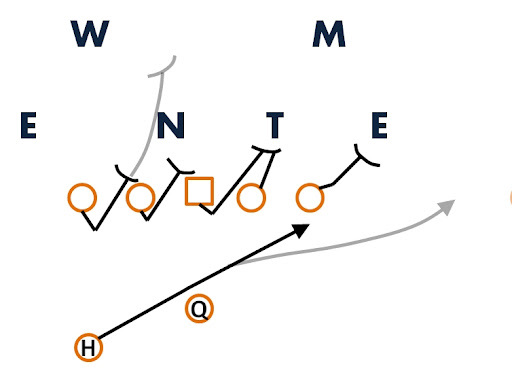 It is this simplicity that allows it to be so effective and helps package the entire offense into easily distilled decisions for the quarterback. Mazzone’s run game is an extension of galvanized concepts he has carried with him during his career. What is distinct about Mazzone is how he’s held true to that Erickson philosophy. He doesn’t run stretch, he’ll run zone, zone read and trap, but for perimeter attacks, it is reduced to flash, tunnel, slow screens, and swing from play-action. This isn’t unlike West Virginia under Rich Rodriguez or Tulsa under Herb Hand and Gus Malzahn, who were renowned for speed sweeps and power, but made their living off of zone and zone-read options. OUTSIDE The other end of the spectrum here is where most other teams are at in terms of the spread run game, using stretch as the primary means of running the ball. This creates a bit of a quandary that opens a door of additional answers. When you operate in a true one-back gun environment without a tight end, running stretch can be a challenge. Without a tight end, you need the play-side tackle to reach an athletic defensive end who is in pass-rush mode for the better part of the game. You are also aiming for an area where you’ve already drawn defenders to by alignment (perimeter). This can be a cheap way of gaining yards (relying on cutting and reaching on the line), much like flash screens, where you don’t need killer blocks to gain positive yards. You don’t have to be tremendously athletic to reach a defender, but the better the athlete, the better the backside runs will be (because your backside guard/tackle can actually get close enough to cut backside linebackers). If you’re aiming point is to a ghost tight end, the read will most often be closed or consistently muddy for the runner. With all linemen bucket-step reaching play-side, it really amounts to just cutting off/getting in the way of defenders. Because that second down defender probably won’t get reached, he will impede the runner from actually bouncing outside (with second-level defenders gap filling inside of him), leaving the cut back the only option. To make up for this liability, you can attempt to fortify your read by adding another blocker (back or tight end) and simply try to invest more resources to improving the run (read). This now invites more defenders back into the box which works contrary to the reason most spread offenses “spread”. The other alternative to making stretch work is to rely on the one guy your “spread” offense is centered around, the quarterback, to assume a dual-role as a runner. This limited end-game is what leads most gun offenses to two answers. now the horizontal stretch on the backside linebacker becomes more pronounced. As an illustration, we’ll use Tony Franklin as the contrast to Mazzone’s run game, though there are many who share the same philosophy of Franklin. Another “coach’s coach”, Franklin has evolved his offense tremendously over the past decade and has been forced to find answers with limited talent. The current version of his offense is largely owed to Dwight Dasher during his time at Middle Tennessee, where there was a heavy reliance on stretch and dash. While at Louisiana Tech, Franklin began tapping into these skill sets more due to the reliance on running back, Lennon Creer (considerably more two-back, “wild dog”, truck, and power). 2011 will likely feature more of the same with the addition of a more mobile passer in Colby Cameron (update: it appears 17-year old Nick Isham is now the starter). These ‘variations on a theme’ may be required to survive if stretch is going to be the source of your gun run game. While all of these counters off of stretch action open up avenues of stress for a defense (it provides a prescription for every symptom), they also require your offense to carry more tools into a game (more plays). We’ve gone over several of these adaptations before and we don’t intend on covering old ground in this post. The point is to illustrate that current meme of stretch offenses centers around heavily exploiting backside horizontal voids, call it your “stretch counter”, if you will. You may need to invest more resources in your run game, but the potential for a greater dividend is there. That being said, throwing a flash screen off your inside zone run action is one thing, it can become an even more explosive off of stretch action (see below) because of how it creates an inside void for the receiver to run through. This all just accentuates the recurring theme that as things evolve and adapt, it all is cyclical. Trends and flavors of strategy have to remain organic and willing to adapt to their environment to survive. There isn't any assertion here on which method is the best. I am attempting to highlight the efficiency of one method over another. Both offensive styles will run nearly the same passing concepts, both 5-step, quick, and screens. The question would be posed on how much of a return should you expect on what is needed to be invested to make your run game from the gun work ( when operating from a true 4-wide, sans tight end, environment )? To base your run game out of stretch when you don't use a tight end can become expensive, because it will necessitate the offense to incorporate the many variations to keep it viable. ** Hemlock has followed this with additional perspectives on Noel Mazzone and how a few concepts have evolved through the last decade and how Mazzone marries it altogether.